If you want a super quick and easy dinner, there isn't much better than a one-pot pasta dish! You toss the majority of the ingredients into one pot and cook away! It's so fast and delicious. 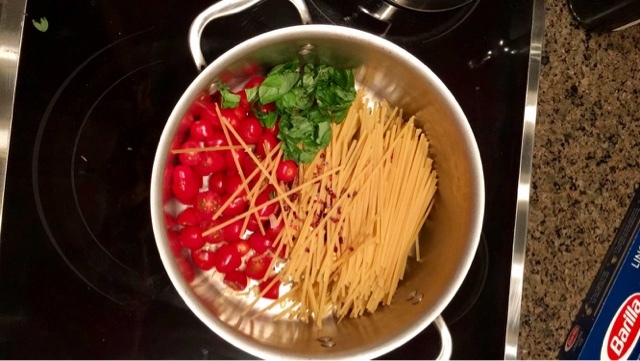 Over the past year or so, I tried several different one-pot pasta recipes and found a lot of stuff wrong with them. It was too watery, too thick, too salty, etc. I have found that this exact recipe that I concocted up is my absolute favorite! The added goat cheese in the recipe can be a bit strong, so please note it is optional. Let me know if you try it or make any of your own modifications. Bon appetite!